No matter how corrupt, greedy, and heartless our government, our corporations, our media, and our religious and charitable institutions may become, the music will still be wonderful, Music is well said to be the speech of angels. 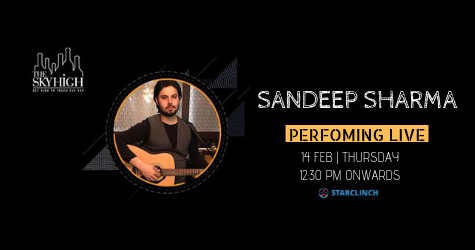 So, come to 'The sky-high' with your loved ones to enjoy the Valentine noon with Akshay Sharma performing live at The Sky High on 14th Feb at 12:30 pm. Akshay Sharma is a professional singer based out of New Delhi. He's been singing professionally for more than 3 years. He started learning music when he was a school kid which gradually turned into his passion. He can sing a number of genres, his forte being Bollywood and Hindi retro. He also has covered a number of English songs as well. Akshay has played at many corporate gigs and private shows. He has played in Zai unplugged, Imperfecto, Raag cafe, and bar, Badmash Company, Peddlers, Masha. And many more.